Designed by KMD architects for the heart of Santa Fe, Mexico the multi-use Parque Centro buries 65,000 square feet of shopping and entertainment facilities and three levels of parking space without impacting the city's green lung above ground. Nor are shoppers plunged into cold darkness thanks to deep, glazed conical skylights that provide tons of natural light and warmth. The sprawling underground mall features a bevy of shops and entertainment areas, as well as enough parking to tuck away 1600 cars. Aboveground revelers will be oblivious to all this as they enjoy Santa Fe’s central park complete with water features, trees, a jogging track, grass and a performance area. 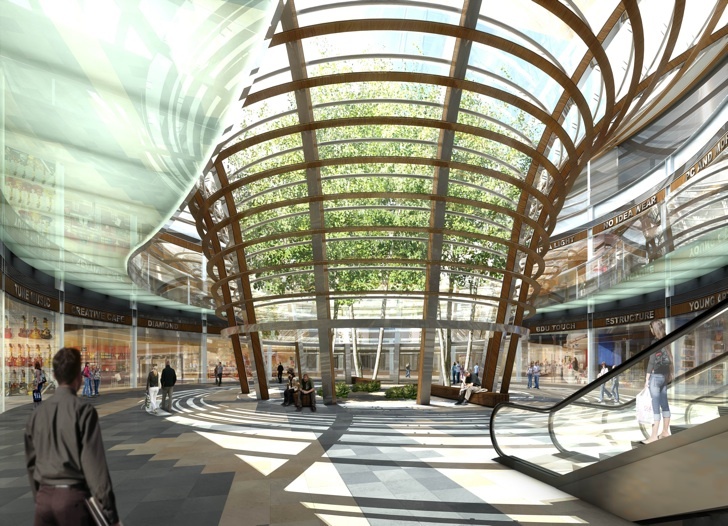 Far from a dungeon, large, glazed conical lights will funnel light into the mall without creating excess solar gain. The green-roof (the park) will insulate the building and reduce the need to air-condition the facility. Natural ventilation will ensure superior air quality and temperature, which combined with on-site solar electric facilities create one of Mexico’s most sustainable buildings. Far from being a dungeon, the underground mall in Santa Fe is flooded with light from above. The mall will feature 65,000 square feet of shopping and entertainment. The above ground urban park will insulate the mall and three levels of parking to reduce cooling loads. Solar electricity will also be generated on site using a small number of solar panels. Mexico's shoppers can buy their wares in a massive mall that lies 18 meters beneath a vibrant urban park. Also available are three levels of underground parking - enough to accommodate 1600 cars! 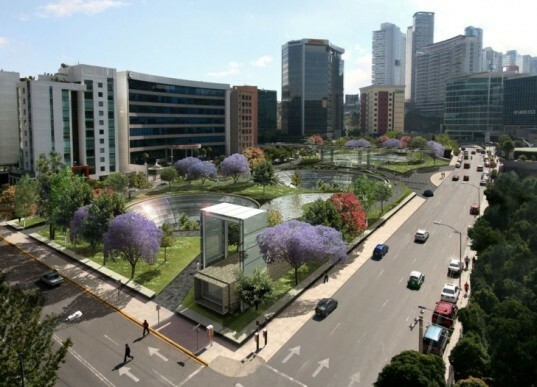 Set in the heart of the original Santa Fe (in Mexico), this beautiful park hides a massive, sprawling mall. KMD architects believe that the underground mall in Santa Fe is Mexico's most energy efficient building.